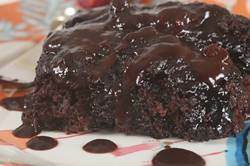 This homey, old fashioned Chocolate Pudding Cake has two delicious layers, a moist chocolate cake and a thick chocolate pudding sauce. It is everyday fare, rich and satisfying, and perfect when served warm from the oven with a scoop of vanilla ice cream. You may know this dessert as a Hot Chocolate Fudge Cake, a Chocolate Brownie Pudding Cake, a Chocolate Upside Down Cake, or maybe as a Self-Saucing Chocolate Pudding Cake. I often thought a Chocolate Pudding Cake was the precursor to the more decadent Molten Chocolate Cake as both have a chocolate cake and a chocolate sauce in one dessert. Only this recipe is not readily found in cookbooks as, more often than not, it is one that has been passed down from one generation to the next. When you make a Chocolate Pudding Cake, you do not need an electric mixer, everything is mixed by hand. There are two parts to this recipe, the cake and the pudding sauce. Let's begin with the pudding sauce which means stirring instant coffee into boiling water unless you have some freshly brewed coffee on hand. The next step is to mix together some brown and white sugars, along with unsweetened cocoa powder (regular unsweetened or Dutch-processed). Finally, we make the cake batter which is done by whisking the dry ingredients in one bowl, the wet ingredients in another. The two are mixed together, along with some walnuts, and the batter is made. Once the cake batter is spread onto the bottom of a square cake pan, the sugar mixture is sprinkled over top and the hot coffee is poured over top of that. (Some recipes call for adding the sugar/cocoa mixture directly into the hot water. However, when you sprinkle the sugar/cocoa mixture directly on the cake batter, it gives the cake a crisp outer crust, which I prefer.) This strange looking mixture is then placed in a moderate oven and while it bakes it is transformed. Miraculously the cake batter rises to the top of the pan and becomes all puffed and cracked with the sugar/cocoa mixture forming a crisp crust. Conversely, the hot coffee thickens and sinks to the bottom of the pan becoming a pudding sauce. The Chocolate Pudding Cake is done when the cake starts to pull away from the sides of the pan. This dessert is best when served shortly after it is removed from the oven, preferably with a scoop of vanilla or coffee flavored ice cream. If there are any leftovers, they can be covered and stored in the refrigerator and simply reheated in the microwave the next day. Chocolate Pudding Cake: Preheat oven to 350 degrees F (180 degrees C) and place rack in center of oven. Butter, or spray with a non stick cooking spray, an 8 inch (20 cm) square baking dish. Pudding Sauce: Stir the instant coffee into the boiling water. (Can use freshly brewed hot coffee.) In a separate bowl, stir together the white sugar, brown sugar, and cocoa powder. Cake: In a bowl, sift the flour with the cocoa powder, salt, and baking powder. In another large bowl, whisk the egg with the melted butter, sugar, milk, and vanilla extract. Stir the flour mixture into the egg mixture until combined. Stir in the chopped walnuts. Spread the batter evenly onto the bottom of the prepared pan. Sprinkle the sugar/cocoa mixture evenly over the cake batter. Gently pour the coffee mixture over the cocoa mixture. Bake for about 25 minutes or until the cake is puffed and just beginning to pull away from the sides of the pan. Remove from oven and place on a wire rack. Serve warm or at room temperature, either plain or with vanilla or coffee flavored ice cream. Leftovers can be covered and stored in the refrigerator. Reheat in microwave. Alexander, Stephanie. The Cook's Companion. Lantern. London: 2004. Murray, Rose. Hungry for Comfort. Penguin Canada. Toronto: 2003. Stern, Bonnie. Desserts. Random House. Toronto: 1988.